Are you starting to think about foods for Valentine’s Day? You can add these Dark Chocolate Raspberry Truffles to the list. I also have some Strawberry Creme Truffles and some Gluten Free Red Velvet Donuts you can try. These yummy truffles only contain 6 ingredients and they are delish! I added some salt to the tops of mine, but that is totally an optional ingredient. Not needed, but nice if you like that sweet/salty combo. These truffles pack a punch of chocolaty flavor. There is chocolate in the inside, and outside. My chocolate loving husband gave these a thumbs up. I hope you enjoy them too. The perfect treat for any chocolate lover. In a food processor , combine the dark chocolate bar, raspberries and dates. Mix together for a minute. Add the coconut flour and mix for another minute. Use a cookie scoop to form the truffles and place on a lined baking sheet . Put them in the freezer for 1 hour. Melt the dark chocolate chips and almond milk in a double boiler. If you didn't want to use the dark chocolate chips and almond milk, you can make my 3 ingredient chocolate recipe and drizzle over the truffles. Once the chocolate is melted, you can roll each truffle into the chocolate and place back on a lined baking sheet . Put them back in the freezer. Wait about 30 minutes before eating. Enjoy! Please keep these stored in the freezer. Enjoy! Oh my goodness you have totally outdone yourself with these! Chocolate and raspberry is the BEST combinations out there! I am assuming I can use any gf flour correct? I usually dont have coconut flour on hand. Thank you for developing an amazingly tasty and healthy truffle that all of us chocolate lovers can enjoy without the guilt! And my guess is these need to be stored in the fridge (assuming they last that long!) I have company coming and this would be perfect. I don't usually bake. I would eat it all, myself. So, instead of using a double boiler...is there something else I could devise to use? Would a pyrex bowl over boiling hot water, in a pan work? I think this the fastest I've clicked one of your E mail links. 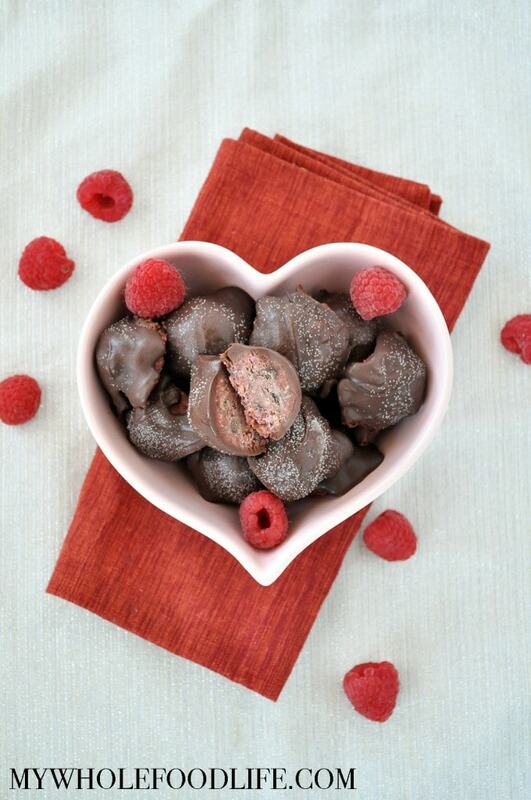 Raspberry Chocolate Truffles that are GF to boot? BING!! I adore these two together and can't wait to give this a go. To have one of my two favourite Truffles available to me again....Living up to my E mail addy/Nickname!! :oD BTW, we're going to try your Maple Coconut Popcorn for watching the Puppy Bowl Sunday (Not NFL/CFL fans, so the Super Bowl doesn't get watched here) and can't wait!! Mom was going to make a batch of Caramel, but told her to wait and try yours first. Simply because it sure seemed a lot easier clean up to me!! Thanks for all the great recipes and all you do. You are one of the many hardworking people out there that makes being Celiac less of a struggle. These truffles look amazing!!! I am obsessed by how you used dates to sweeten them without the addition of sugar! Ooh.... Raspberries and Chocolate? Love.... I love how you haven't used loads and loads and loads of white sugar! Or maple syrup because that's super hard to get into a student budget!!! Now will someone please pass the coconut flour? Raspberries and chocolate make the BEST combo! You're welcome Diana! I am glad you liked the recipe. Melissa, these are wonderful! I absolutely love the combination of raspberry, dark chocolate and mint! So I modified your recipe a bit and opted for 100% cacoa (I love that bitter taste) and a couple mint leaves, and it was delish!